Soutien Gorge return to Boltfish for their beautiful contribution to our FREE mp3 releases. ""…The same – simple and childish ("8-bit") melodies - applies to Soutien Gorge new free two-track release, which is out at the Boltfish label’s webpage, the label that released their previously reviewed cd. Apart from that the duo is now on the other end of electronica: it’s idm-ambient, this time with way less Hungarian speech samples. All in all, the two tracks are nice and pleasant." "My relationship with music is more or less passionate, like a first love, raw and simply delicious. Depending on what I pick up each year, I more or less fall for it like a teenager. These are usually fleeting love affairs, but occasionally, the new seed takes root and feeds my nostalgia. The latest work from Soutien Gorge (the duo of András Hargitai and Róbert Potys), is another of these magnificent loving episodes. Upon hearing this two track EP it quickly transported me to some years ago, when I actually was a teenager with a less hectic life." "There are not so many genres to which it is true that when I hunger for them, a Hungarian label crosses my mind in the first place. Ambient is one of those genres. András Hargitai aka Banyek is strenuously managing Bitlab Records. This was the label where Soutien Gorge’s (András’ and Robert’s duo) first album titled L’étoiles Souriantes was released (which I have also reviewed). Since then, they have been trying themselves out abroad as well. The London-based Boltfish Recordings has released their five-track mini-album titled Vízállásjelentés, and Szerelmes Nóta/Délutániád has just been out at the same label. This last one is for free, so you should also try it out! Soutien Gorge songs are not the ones that you are going to talk about each and every time you meet your friends for a beer, though if you play them at some proper moments they can really please you." "…here I introduce you the brand new release of the rather well-known Soutien Gorge (the duo of Banyek & Róbert Potys). I could imagine these two tracks as a soundtrack for some animated movie with cute and tiny animals, and who knows, maybe once I’ll meet these grooves again when I watch the Minimax channel. Till then, you can download them, it is still fresh!" "Soutien Gorge is one of the really interesting music projects in the Hungarian electronica scene. Soutien Gorge albums are the fruits of the collaboration between András Hargitai and Róbert Potys, and on them you can find a melody-centred minimal style. Their works feature samples of speech in prose (TV series, radio announcements like ‘vízállásjelentés’) or works of art (films, poems) that are taken from some popular context to the wider musical space. Their music is experimentation: the factual creation of certain sounds and accomplished melodies. Their tracks reflect a certain kind of naïve and humorous attitude, which makes the slow melodic themes experiential for the listener. I have to admit, that apart from taking a look at it sometimes, I have never really dealt considerably with electronic music. Electronic music itself is such a diverse genre, that it is really easy for an outsider to lose the way in it, and it becomes hard to find the actually interesting and valuable authors. It is surprising in the case of Soutien Gorge, that it openly admits its naiveness, and doesn’t make any mistake by putting together dance-oriented or brain-squeezing symphonies to be exploded and impacted on the listener immediately. The certain sounds are always under the command of the melody, and they never want to be interesting per se, and people don’t feel like "check this part out here, it is great". If I wanted to put it in a visual way, I would say that we won’t get from the kick-start to the goal, because there is continuous game on the musical field instead. Besides, concerning the form it is lucky, that they kept to the song-like structure after all, and all the tracks have an arch. 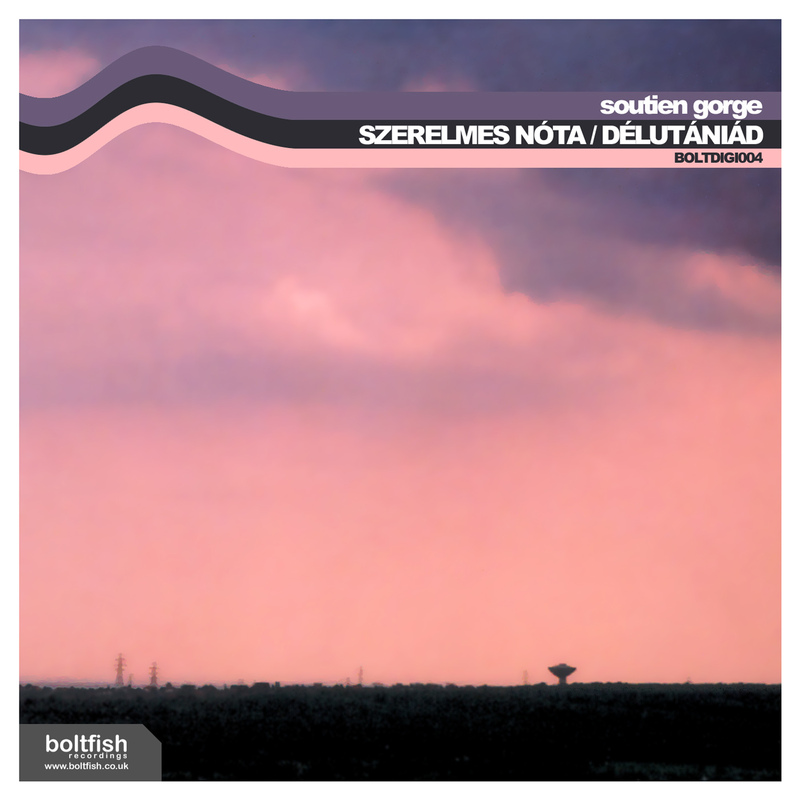 There are two pieces on this new mp3 release: One is Szerelmes Nóta, the other is Délutániád. What I’ve mentioned about naiveness above, is most definitely true for these tracks. Szerelmes Nóta is even charming concerning it’s lyrics: "Van nekem egy virágom, azt neked adom, jó? én úgy hívom, hogy gondoljrám virág." (I have a flower, I’ll give it to you, right? I call it "think about me"-flower.). There is no seriousness here, just sometimes a bit of a tension with the drums, but the synths are always floating, and the bass melody creates a playful feeling as well. This track becomes special for me from its last couple of seconds, since the music runs out of itself after the zenith point, and what solely remains is the stripped-down basic melody. It is just the depths that are lost (drums, bassline), and after that it is completely different to look back again on that "think about me"-flower. The musical solutions and the basic feeling as well reminds me of the space records from the end of the 90’s and the beginning of the 00’s, which means a bonus point in my case. Délutániád represents a more peripheral and more underground musicality. It bears a darker and more complex structure, and somehow we face a more noticeable repetitiveness. The dullness of the bassline especially annoys me, it is really strange to pay attention to the dubby drums and the continuously arriving flashes. The case is somewhat similar if one was gazing at the slow motion of the clouds throughout the afternoon, and all of a sudden a "zápor, zivatar, jégesõ, felhõszakadás" ("shower, rainstorm, hail, downpour") would arrive. The scientific clarity is changed by a more scratchy sound, and I think it was a pity to make it fade out suddenly. The melodies are very good and interesting, and maybe the simple reason why it is intensive to listen to Délutániád is that we feel that the spot could be hit harder if it was performed by a space-rock band with live processed drums, and more concrete and distorted guitars. "